Hookworms are a dangerous helminth (parasitic worm). With their ability to create long lasting infections and feeding behavior that involves creating bleeding wounds in a host’s intestine, they are able to cause damage to humans and wild animals alike. However, despite these detrimental consequences to the host, death is a rare occurrence, except among seals and other pinnipeds. 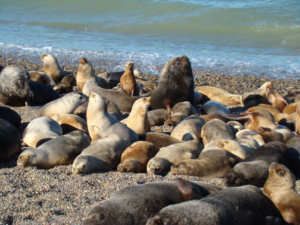 CEID members Mauricio Seguel and Nicole Gottdenker along with others investigated the deaths of South American fur seals due to hookworms. Hookworms can cause up to a 70% mortality rate among eared seal pup during a reproductive season. The deaths are due to wounds in the intestines and then infections in the wounds. Pinnipeds spend a large amount of time in the water and come to shore during the reproductive season which gives helminths (parasitic worms) a short period of time to infect. With the shores subject to intense weather, hookworms have adapted to increase their chances for survival, and therefore increase mortality rates among pinnipeds. Researchers used field data and experiments to better understand the dynamics hookworm transmission in pinnipeds with high levels of parasite induced mortality, as well as determine how feasible it is for the parasite to alter transmission to synchronize with host reproductive cycles. Results found that pups with higher parasite burden experienced greater anemia and mortality and lower average body mass than those with lower parasite burden. Existing research shows that many helminths have adopted feeding behavior that reduces short term reproductive output of the helminth, in favor of feeding behavior that keeps their host alive longer, thus increasing the infectious period and chances for spreading infection. However, results from this study found that pinniped hookworms have an effective aggressive feeding style, suggesting that the strategy employed by other helminths may not be suitable for the extreme winter temperatures found in pinniped habitats Pinniped hookworms have developed a specific transmission method to correlate with the reproduction cycle of seals, by transmitting hookworm larva to pups via milk. The pups then quickly shed the eggs allowing them to develop and quickly find a host while many seals are still present on the shore. While pinniped hookworms have a short life span and die off quickly in comparison to other helminths, it is due to their specialization to match their marine hosts that they have adopted this lifestyle.